Work with a comprehensive catalog of GPU-accelerated containers, including NVIDIA-optimized deep learning software, third-party managed HPC applications, NVIDIA HPC visualization tools, and partner applications. Solve complex molecular modeling calculations faster, or analyze massive amounts of seismic data. By running smaller tasks concurrently, GPUs harness the processing power needed for high-performance computing. Run a full enterprise from the cloud with unparalleled compute performance, speed and accuracy. Provision bare metal or virtual servers with cutting-edge GPU hardware to handle your most complex compute-intensive workloads - from analytics and graphics to energy exploration and machine learning. 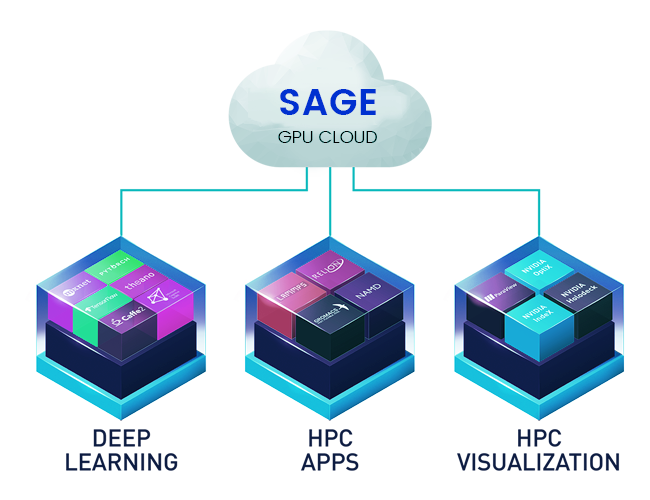 SAGE GPUCLOUD (SGC) provides researchers and data scientists with simple access to a comprehensive catalog of GPU-optimized software tools for deep learning and high performance computing (HPC) that take full advantage of SAGE GPUs. The SGC container registry features SAGE tuned, tested, certified, and maintained containers for the top deep learning frameworks. It also offers third-party managed HPC application containers, SAGE HPC visualization containers, and partner applications. Bare metal and virtual server monthly and hourly options available to meet every workload demand. Success! Your message was sent succssfully! Innovate in Minutes, Not Weeks. Get up and running quickly and reduce the complexity typically associated with setting up software.